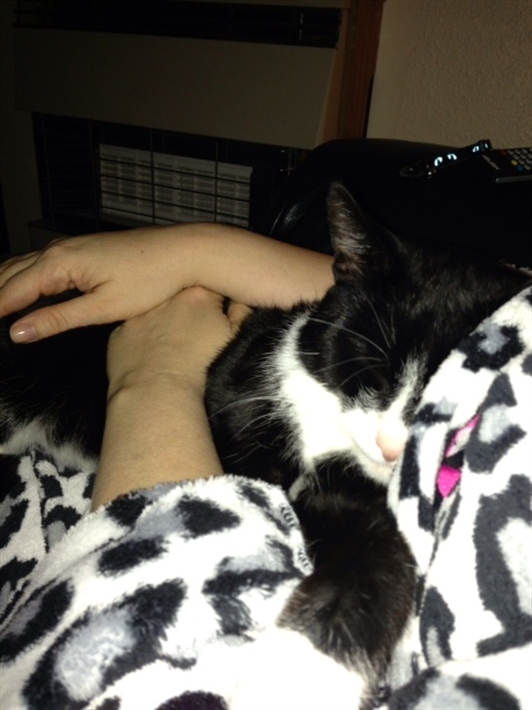 An allergic owner meant 2 year old Felix came into care in December 2012. This gorgeous boy was so snuggly and cuddly and from the look of things, that's continued in his new home when he was adopted in January 2013 - just what we like to see! New owner Steph said that Felix has settled in really well. She did have some reservations the first night when she didn't get to sleep until 5am! Felix decided to explore every inch of the house and dive bomb his owners from the windowsill when they were in bed. Fortunately Felix has adapted to his new environment and has become part of the family. He likes nothing more than watching the world go by from one of the many window sills, chasing after his laser pointer and snuggling for cuddles. He's very inquisitive, or as Steph says, mischievous but the family are very happy with their new addition. Steph kindly wanted fosterer Nicky to know Felix had settled in and was being well looked. Nicky had become quite attached to her feline charge. That’s an occupational hazard of fostering – you want a good home for the cat but miss them when they’re adopted!